An expenditure represents a payment with either cash or credit to purchase goods or services. An expenditure is recorded at a single point in time (the time of purchase), compared to an expenseAccrued ExpensesAccrued expenses are expenses that are recognized even though cash has not been paid. These expenses are usually paired up against revenue via the the matching principle from GAAP (generally accepted accounting principles). For those who are unaware of the matching principle which is allocated or accrued over a period of time. This guide will review the different types of expenditures used in accounting and finance. To record the occurrence of an expenditure, an accountant must show evidence of the transaction occurring. For instance, a sales receiptSource DocumentsEvery time a business is involved in a financial transaction, a paper trail is generated. This paper trail is referred to in accounting as source documents. Whether checks are written to be paid out, sales are made to generate receipts, billing invoices are sent by suppliers, work hours are recorded on an employee’s time sheet – all the respective documents are source documents. will show proof of an over-the-counter sale, while an invoice will indicate a request for payment for goods and services. The documents exist to enable organizations to maintain a tight control over their transactions. Usually, the goal is to anticipate profitsRetained EarningsThe Retained Earnings formula represents all accumulated net income netted by all dividends paid to shareholders. Retained Earnings are part of equity on the balance sheet and represent the portion of the business’s profits that are not distributed as dividends to shareholders but instead are reserved for reinvestment and losses while still keeping track of the revenuesSales RevenueSales revenue is the starting point of the income statement. Sales or revenue is the money earned from the company providing its goods or services, income. It’s important to understand the difference between an expenditure an expense. Though they seem similar, they’re actually different and have some important nuances you must know about. Expenditure – This is the total purchase price of a good or service. For example, a company buys a $10 million piece of equipment that it expenses to have a useful life of 5 years. This would be classified as a $10 million capital expenditure. Expense – This is the amount that is recorded as an offset to revenues or income on a company’s income statement. For example, the same $10 million piece of equipment with a 5-year life has a depreciation expense of $2 million each year. 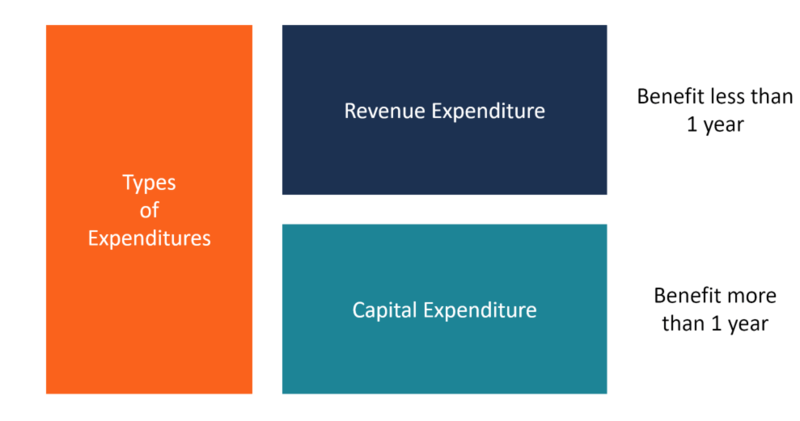 A company incurs a capital expenditureHow to Calculate CapEx - FormulaThis guide shows how to calculate CapEx by deriving the CapEx formula from the income statement and balance sheet for use in financial modeling and analysis. To calculate capital expenditures, use depreciation on the income statement, add current period PP&E and subtract prior period PP&E (CapEx) when it purchases an asset with a useful life of more than 1 year (a non-current asset). In many cases, it may be a significant business expansion or an acquisition of a new asset with the hope of generating more revenues in the long run. Such an asset, therefore, requires a substantial amount of initial investment and continuous maintenance after that to keep it fully functional. As a result, many companies often finance the project using either debt financing or equity financing. Unfortunately, there are caveats to capital expenditure when it comes to asset liquidation. Some of the options available are either an asset reaches full depreciation, or a company undergoes liquidation. Because the investment is a capital expenditure, the benefits to the business will come over several years. As a consequence, it cannot deduct the full cost of the asset in the same financial year. Therefore, it spreads these deductions over the useful life of the asset. The value of this asset will be shown on the balance sheetBalance SheetThe balance sheet is one of the three fundamental financial statements. These statements are key to both financial modeling and accounting. The balance sheet displays the company’s total assets, and how these assets are financed, through either debt or equity. Assets = Liabilities + Equity, under non-current assets, as plant, property, and equipment (PP&EPP&E (Property, Plant and Equipment)PP&E (Property, Plant, and Equipment) is one of the core non-current assets found on the balance sheet. PP&E is impacted by Capex, Depreciation and Acquisitions/Dispositions of fixed assets. These assets play a key part in the financial planning and analysis of a company’s operations and future expenditures). Let’s say Company Y deals with iron sheet manufacturing. Due to the increase in demand in its high profiled iron sheets, the company executives decide to buy a new minting machine to revamp the production. They estimate the new machine will be able to improve production by 35%, thus closing the gap in the demanding market. Company Y decides to acquire the equipment at the cost of $100 million. The useful life of the machine is expected to be 10 years. In this case, it is evident that the benefit of acquiring the machine will be greater than 1 year, so a capital expenditure is incurred. Over time, the company will depreciate the machine as an expense (depreciation). A revenue expenditure occurs when a company spends money on a short-term benefit (i.e., less than 1 year). Typically, these expenditures are used to fund ongoing operations – which when they are expensed are known as operating expenses. The actual expenditure itself does not increase or decrease the income of the business. It is not until the expenditure is recorded as an expense that income is impacted. CapEx is related to a long-term item while a revenue expenditure is related to a short-term item. They are both recorded in the same financial year as they are incurred, and cannot be forwarded to the next financial year. After the purchase of the minting machine, the company may decide to hire a new lead engineer together with seven other technicians to run the new machine. A fundamental role of this team will be keeping the equipment running throughout the production cycle. Other secondary tasks may include installation of new parts, monitoring production, and continuous maintenance. The hiring of the engineer and technicians is considered a revenue expenditure. Deferred revenue expenditure, or deferred expense, refers to an advance payment for goods or services. This is an advanced form of prepaid expenses. The arrangement is usually an agreement that the company will receive a service or goods in the future after it pays for the same at the time of purchase. As a result, the company treats the transaction as an asset until it receives all the benefits. In the books of accounts, the arrangement doesn’t affect the business’s profitability because the company is yet to acquire the asset and does not yet receive the benefits of the asset. The company charges the outcome of the transaction to the profit or loss account over a given timeframe. Let’s assume that Joe specializes in the manufacturing of refrigerators. A part of his production inputs ships from overseas. Due to the sensitive nature of the production, Joe needs a consistent, high-quality, dependable supplier of raw materials. So he reaches out to his distributor X, who supplies him with condensers and compressors. But Joe needs to pre-pay for the goods. Also, according to the terms, he must wait for his supplies for three years. In such case, Joe pays for his supply in advance. In his books of accounts, he will declare the arrangement as a deferred payment until he receives his shipment. Clearly, in accounting such a financial settlement becomes an asset. It is because the asset can appreciate or depreciate depending on the future state of the market.